Pannell Discussions » 198 – Chinese air pollution » Ideas in economics, environment, policy and more. 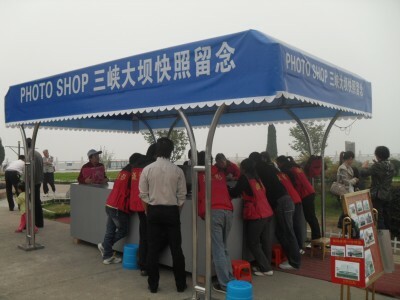 China impresses visitors with what a “can do” place it is. One thing they haven’t decided to do yet is fix their air pollution problem. Beijing residents seem to be fairly oblivious to it but I found it hard to ignore. In the 19th century, London was famous for its air pollution. The endless smog made its residents sick (and sometimes killed them), put a layer of grime on everything in the city, and reduced visibility drastically. The main cause was burning of coal in homes and factories. After about 1890, thanks to reductions in living density, the growing use of gas for cooking, and, to a small extent, the Public Health Act of 1891, air quality in London began to improve. Pollution fell steadily over the following century, reaching about 3% of its 1890 level by 2000 (Fouquet, 2011). Air pollution in Beijing today is actually not as bad as it was in London 120 years ago, but it’s pretty bad. I spent three days there last week, and found the pollution endlessly fascinating. At times, one could not even see a block away. Apart from the physical feeling of having something bad in my chest, and the need to cough regularly to clear it, the smog affected me psychologically. The fact that I couldn’t see far enough to get any sort of perspective of the lie of the land, and couldn’t see whether it was sunny or cloudy above the murk, made me feel closed in. Just like in London, a major contributor to the problem in Beijing is coal, although this time it is being burnt in power stations rather than homes and factories. As well, there are many other sources, as you’d expect in a city of 21 million people. In the second half of the 20th century, regulation made important contributions to reducing air pollution in London and in other western cities. Environmental economists also convinced some governments to use market approaches, particularly in the US. These too have been very successful in some cases, with the most famous example of this approach being the use of a cap-and-trade system to reduce sulphur dioxide pollution in the US. (This scheme has recently fallen over for administrative/legal reasons, rather than economic ones, but that’s another story). I expected the bad air pollution in Beijing, as it’s been widely reported. What I wasn’t prepared for was how bad it was outside major cities. 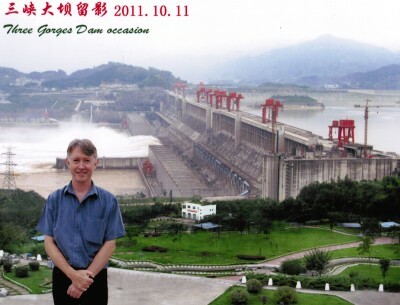 I visited the Three Gorges Dam — perhaps the ultimate example of “can do” in the world. From the tourist lookout built to help tourists admire the dam, one’s ability to appreciate this awesome engineering achievement was somewhat hampered by an inability to actually see it! Here is a photo, taken from the lookout, of the dam wall. And here is a shot from the dam wall across the reservoir towards the scenic gorges. One of our guides told us that the main problem was a phosphorus mine nearby. Another said that the area had always been subject to fog, but that it had got worse recently. To the extent that it is caused by pollution, it is, perhaps, surprising that they allow it to occur here, shrouding such an an iconic symbol of national achievement. Nevertheless, this being China, every problem is an economic opportunity. I was originally bemused to see, just near the lookout, a booth offering to take photos of tourists with the dam behind them.  It seemed like a forlorn venture, given the poor visibility. I couldn’t understand why they seemed to be doing a steady trade. But look at the name of the business. They aren’t joking. Realising that people would be mighty disappointed to come to the dam and walk away without a decent photo, someone hit upon the brilliant idea of photographing people and then using Photoshop to add them to a photo of the dam taken on a rare clear day — well, relatively clear. How could I resist! Giggling madly, I bought the following totally fake picture. Priceless! 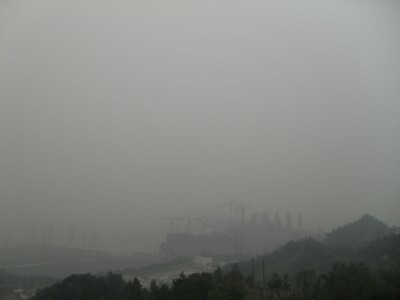 I expect that, sooner or later, China will apply its “can do” approach to environmental management. Perhaps it has already started. The China Daily while I was there had an article titled ‘Environmental rule set to shift’. It said, “Local governments at all levels are expected to face stronger obligations to protect the environment, and polluters will face much heavier fines, according to a draft proposal to amend China’s decades-old Environmental Protection Law” (China Daily, 10 Oct 2011, p.7). It will be fascinating to see whether this is the start of a new environmental commitment. Fouquet, R. (2011). Long run trends in energy-related external costs, Ecological Economics 70: 2380-2389. Posted on 17 October, 2011 by David Pannell. This entry was posted in Economics, Environment, Policy.